I found these nymphs huddled together on one morning under soft sunlight. Recently I have posted mating of this species, which are green in color. The nymph have yellow color on their backs. The adults emerge from this nymph after molting, which I happened to capture, will post it later. A nice capture of these trio. Very beautiful juveniles. Your capture is excellent with sharp details and very good composition under low light condition. Thanks a lot for sharing. A brilliant capture of these three youngsters keeping close together. They're very beautiful and your capture is very sharp showing fantastic details and colours. A fine background and well composed too! A top class macro of three Bug nymphs huddled on a leaf. I like the composition, lighting and colours with the sharpness and BG up to your high standard. Interesting to see that the nymphs are more warning-coloured than the adults. Excellent photo in splendid colours. The contrasts are gorgeous. Great sharpness and details. A surprising, pleasing composition. Very good blurry BG. what a great shot from this 3 bugs. Good pov and detailed picture and razor sharp. TFS and have a nice new week! Tripartite meeting of the wonderful moments you've captured. Timing, Vibrant colors, excellent detail and very Sharpness. Very besutiful nymphs of shield bugs. Amazing their coloration, like little jewels. A cute trio in conversation! Very charming! Sharpness, light-management and composition are excellent. quite spectacular, these bug larvae. You did a very good job, usually the metallic reflections always give headaches to a photgrapher. I am glad you also came up with an ID, that is not easy with larvae. Thanks for the presentation. 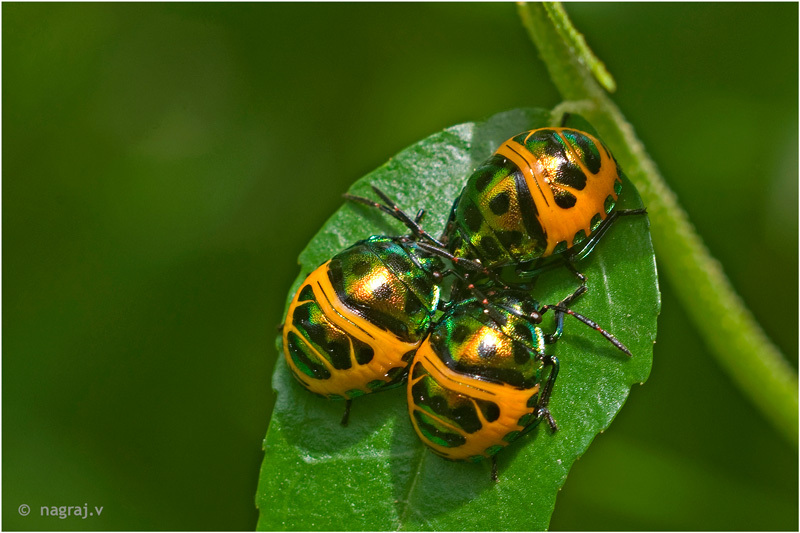 what a great macro shot of trio of very beautiful bugs, with superb colors and great sharp details. light using, exposure, POV/DOF and composition superb. thanks for sharing this beauty. well done. Vaya los has pillado mientras conversaban, una fantastica imagen y fantasticos colores met�licos. parecen sus caparazones de espejo. muy buen POV y perfecta nitidez. What a wonderful trio of these beautiful babies. They are so small and so perfect with beautiful markings , gorgeous colors and excellent details. I love they way they are posing on the leaf. A stunning picture with the green background making the orange color jump off the screen. Originalidad y efectividad en esta captura. Buenos brillos y colores. Preciosa. what a meeting they are having. The view is so lively in its glimmering golden reflection. you have presented and composed it so well, giving an attractive and exciting scenery. These small bugs are really difficult to capture in good details as you did. Great find of a troop of shield bugs. Nice details and well exposed shot. what a nice trio of Lychee shield bug. great colour and good composition.